Glamorize your wedding and party tables with this stunning masterpiece of seamless sparkle that features rows and rows of gem cut crystal beads, masterfully looped by shiny metallic gold rings. Combining intricate craftsmanship with regal glitz and glam, this lovely vase is an ideal decorative accent to elegantly titivate your Home, Office, or Party Space. Glistening metallic gold surface coupled with the multi-faceted acrylic crystal gems impart a royal feel and an opulent appeal to any table settings. 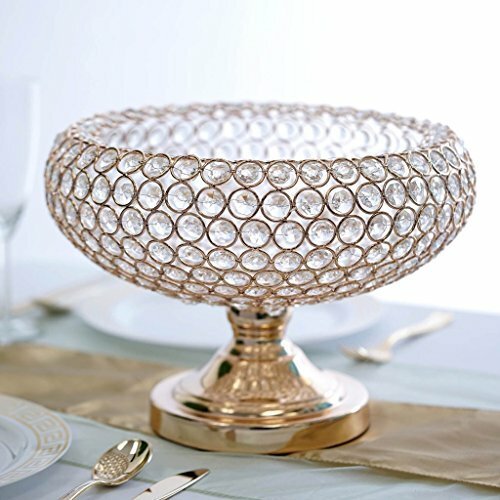 This ornate beauty makes an affectionate gift to remind your loved ones of your elite aesthetic taste, and can also be used as a luxurious Candle Holder, Flower Vase, Flower Ball Holder, or simply as a deluxe Wedding Centerpiece. For a truly gorgeous setup, pair this plush piece with our Acrylic Crystal Candlesticks, Candle Holders, Chandelier Vases, Glass Candelabras, Crystal Pendant Centerpieces, Metal Cake and Cupcake Stands, and other Diamond Crystal Ornamentations. If you have any questions about this product by Efavormart.com, contact us by completing and submitting the form below. If you are looking for a specif part number, please include it with your message.